Slazenger's nano process enhances the quality of the frame at a molecular level. This increases the uniformity between the resin and the carbon fibres producing a more consistent and stable bond. 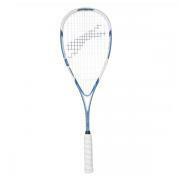 The result is a additional tensile frame strength which produces a more powerful racket that is also more stable on off-centre hits.